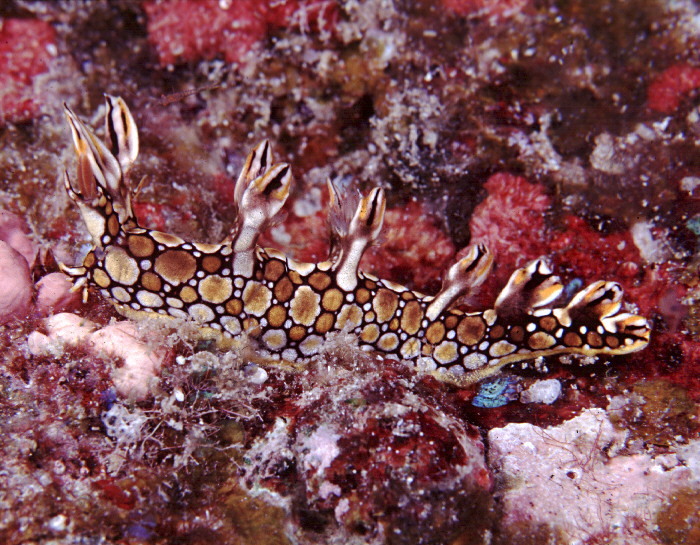 While diving at South Point on the island of Hawai`i (the southernmost point of land in the U.S.A.), I noticed this unusual nudibranch on the basalt cliffs at a depth of about 20 ft. (7 m.) patterned somewhat like a giraffe, with paddle-like cerata protruding from its back. Not recognizing it, I popped it into a clear ziplock bag for a later photography session in anticipation of a new record for Hawai`i. Immediately the animal began swimming actively against the side of the bag with the fluid wriggling motions of a tiny eel. Confused, I thought for a moment that it was actually a strange fish that mimicked a nudibranch. Yet the animal definitely possessed a molluscan foot; it had to be a slug after all. After taking pictures I let it go. Regretfully, there was no way to bring it home to O`ahu alive. I could only hope that the pictures came out. "Yes indeed, that is my beast. I had the same reaction. When I was at Enewetak, a friend (now my wife) who was working here on Kwaj at the time, called me to say she'd found a strange swimming nudibranch. I thought, ok, sure, some nudibranchs swim, if you could really call it that. Her description even sounded sort of like a Bornella, and they swim by laterally flexing the body and rising off the substrate. But the color sounded unusual, so I had her send it up alive on the plane. When I took the wrapping off and saw this animal swimming around and around in the jar, I was astounded. And its swimming behavior is why I called it "anguilla." Subsequently, Jeanette found several more at Kwaj, and based on her description of the habitat, I started finding them at Enewetak. 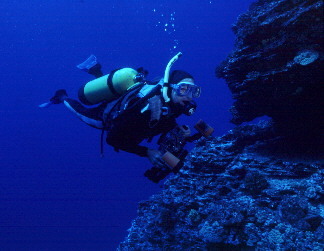 Nowadays, we see them pretty regularly on night oceanside slope dives, living in ledges and caves. The largest specimens I've come across are about 70mm, but they're more typically 40-45mm. I'm delighted to hear you found it in Hawaii. While I was working on it, I received reports from Terry Gosliner and Richard Willan on specimens from South Africa, Western Australia, Queensland, and the Seychelles." I sent a slide to Hawaii's reigning nudibranch queen, Pauline Fiene-Severns, and she confirmed the ID and also confirmed that it was indeed a new record for Hawai`i. Although Scott states that it is primarily a nocturnal species, the specimen I found was out in the open in broad daylight.